For every and any slice of bread, a recipe for the keeping. When Jeppe Jarnit-Bjergsø of Evil Twin Brewing and Daniel Burns (alum of both Noma and Momofuku Noodle Bar) opened Tørst in New York City's Greenpoint neighborhood in 2013, beer geeks flocked to Manhattan Avenue to visit the modernist bar with one of the most comprehensive beer menus in the city. Expertly served with the help of the duo’s “flux capacitor” and other gadgets behind an impeccable marble bar, Tørst’s beer list flattered the food menu consisting of charcuterie, cheese, pickles, olives and Burns’ dark, handmade Danish bread, thickened with flax and sunflower seeds. Earlier this fall, however, Tørst welcomed a new direction, installing a natural wine program and new executive chef Jared Ferguson to replace Chuy Cervantes (who left to help launch Cosme in Los Angeles). Chef Ferguson formerly cooked at Uchi in Austin as well as San Francisco's one-Michelin-starred Sons & Daughters and two-starred Lazy Bear before launching into the new stage of his career at Tørst. Ferguson’s current menu features shared plates like curried lamb stew with turmeric dumplings, and sweet potato soubise with chile brown butter, black garlic and mizuna. 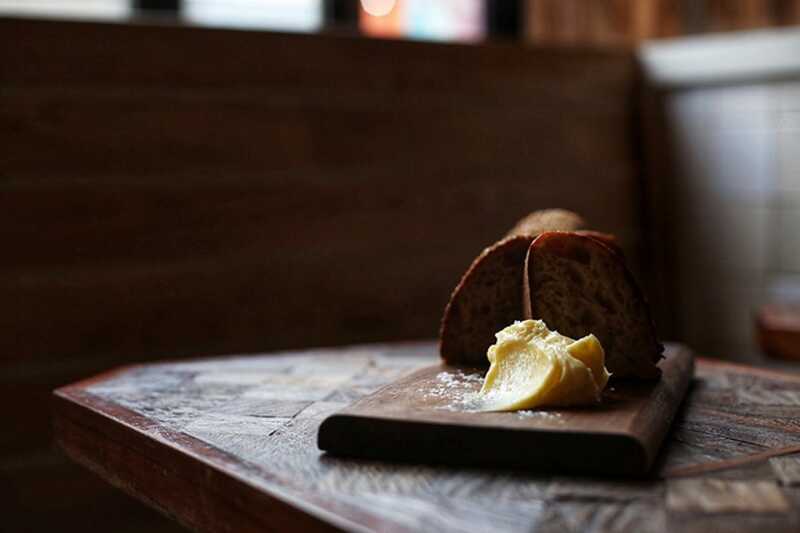 To bring some of the warmth into your own kitchen, try your hand at Tørst’s trusty butter recipe. 1. Sanitize a 22-liter food grade plastic or glass container. Fill the vessel with the heavy cream and cultured buttermilk. Mix well with a whisk then cover the mixture with cheesecloth that is secured with kitchen twine. 3. Once the desired flavor of the crème fraîche (the cultured buttermilk and heavy cream mixture) is achieved, stir the mixture then place the entire container into a refrigerator so that it stiffens and sets up nicely. Let the mixture chill down to fridge temperature before whipping. 5. For the first few minutes of whipping it will seem like nothing is happening. Soon after, the butter fat will begin to separate from the buttermilk and get “really messy and sloshy.” That’s about as far as you will want to whip it. At that point, strain and save the buttermilk for future use and place the butter solids in a chilled bowl. 7. Weigh the pressed butter. Measure 1.8% sea salt based on your final weight of pressed butter. 9. Store the butter in an airtight container for up to a month in the fridge. To serve, pull out the finished butter and let it temper for several hours. *Chef’s Note: We use low-temperature pasteurized, high butterfat [heavy] cream from Pittsford Farms in upstate New York and work directly with them to ensure that our cream is delivered to us twice a week or more, as fresh as possible. Every batch that we make yields a good amount of buttermilk that is used for subsequent batches but is also a perfect base for marinades, sauces and more.